The ADF&G Steller Sea Lion Program supports recovery of Steller sea lions in Alaska through extensive field and laboratory research. We have studied sea lions from the 1970’s to the present. Currently our research is designed to understand the factors impeding recovery of the western population of Steller sea lions, and then compare them to our studies of the eastern population that continues to increase. 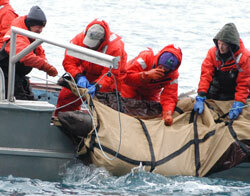 Learn more at the Steller Sea Lion Program website.